June 11, 2018 marked the 29th Anniversary of the Nordby Invitation Golf Tournament, benefiting The Salvation Army, held at the Santa Rosa Golf & Country Club. With an indelible presence in our local community, The Salvation Army is considered one of the most successful non-profits in the world. 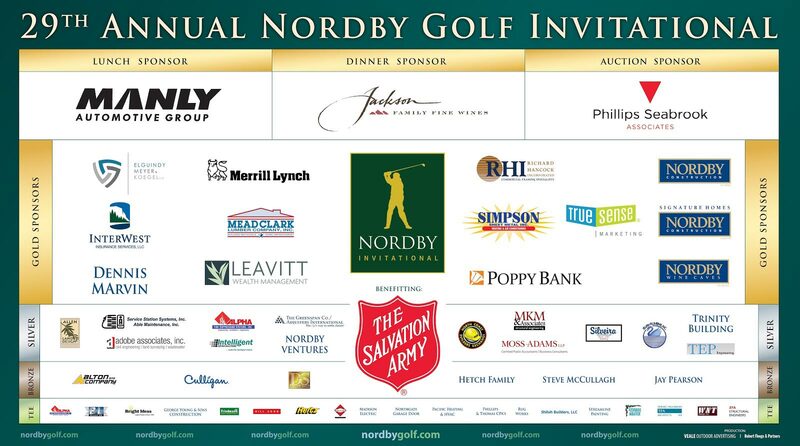 The Nordby Invitational, with your generous support, raised over $71,000 that will directly benefit The Salvation Army through our non-profit agency, OTHERS, and will help to bolster long term recovery support after last Fall’s firestorm. Thank you to all of our volunteers, individuals and businesses that lent their support for this very necessary cause. A special thank you to Captains Rio & Rachel Ray, Santa Rosa Corps Officers; our event emcee, Keith Woods; our auctioneer, Ken Cunningham; and Don Silverek, who captured some amazing footage from this years event. Thank you to the committee that made it all happen: Wendell Nordby, Nancy Nordby, Craig Nordby, Daryl Phillips, Blaine Goodwin, Wayne Rowlands, Alyssa Phillips & Gina Barnes. Hole #6: Marti Evans - 8' 3.5"